The tropical rain is hammering down on a worn blue tarpaulin stretched over a thin steel frame over the deck. The fading light all but disappears under a grey curtain of rain that churns the sea and hides the jagged rocks of the coast nearby. Our captain strains to find his bearings, unsure of himself he signals to the dive master. We’re as close the dive site as we’re going to get and need to get in the to water fast. We struggle with our heavy tanks on the rocking boat and our buddy checks are rushed. My son and daughter don’t seem flustered by all the violence and are waiting for their turn to drop off the side of the boat. This is their first night dive and they are both excited and anxious. So am I. Although they are qualified divers, they lack experience. As a rescue diver, I will anticipate any difficulties they may be unaware off and I know I’ll keep them out of trouble, but still, this is diving and these are my children! Go! The divemaster hollers through rain. One after the other we roll over the side of the boat. It is my turn. For a brief moment I lose my sense of direction as I enter the water. Where is up? At the same time my mind is cycling through my equipment. Mask, OK. Regulator, OK. Belt, OK. BCD clips, OK. Fins, OK. As I right myself I am suspended in nothingness. There is no more sound, this is a world of silence. Looking up, I see the surface of the sea lit by the boat’s lights and turned opaque by the tropical storm. But here under water, all is calm and I float quietly as I take my bearings. It is early evening and below me is deep darkness. The blackness feels like a void, a beckoning and infinite abyss. I wonder if death is a bit like this. Then I see a small light ahead of me. I kick my fins and before long I join the party of divers. We re-check our equipment and swivel our torches around us. The light beams disappear in the darkness as there is nothing to reflect against, except for the odd fish crossing the beams, like shooting stars in this inverted night sky. We make OK signs to each other, making an O with our thumb and index, followed by the thumbs down. We descend. Soon we lose the surface of the sea and other than ourselves, we have no bearings at all. We are in the void. I have dived for two decades and know how to control my fear and my breathing. Going down at night can be scary and judging from the never ending source of bubbles, I can see that my son is indeed scared – he is breathing too fast. Eric is 14 and this is his first night dive. He will calm down as soon as we hit the bottom and regain our references. His sister, Angela, who’s two years younger has no difficulties. She let’s herself drop slowly, adjusting the air in her BCD jacket as she goes. I smile. All is well. Diving with my children as they went through their certification, I learned that fear of breathing underwater is an adult thing. Kids take to it as if it is a totally natural thing to do. They quickly learned to control their buoyancy and whilst we, the adults, move slowly through the water to preserve air, they are all over the place, checking out this coral or that shrimp. They do underwater somersaults and chase each other in a game of catch-me-if-you can. Unlike us, their limited air consumption due to their low body mass, gives them a near infinite supply of air. Our torches catch the sea bottom and we regroup. Being able to see the sandy sea floor and the coral wall rising from it, is reassuring. We’re back in control. Our divemaster knows the site well and takes us to a cave entrance. We won’t go in as not all divers among us are qualified, but shining our torches into the cave, we catch sight of three lobsters, showing off their magnificently claws and antennae. They look proud and fearsome. Whenever I see them at a fishmongers, I feel sad. As powerful as they are in their environment, they become so pathetic outside it. I’m sure they think the same of us. We are pathetic with our silly diving gear. No grace and totally unsophisticated. An evolutionary failure, seen from a fish’s perspective. We are only at about 16 meters depth and the coral is stunning here. Our torches light up the yellow and white-blue fans corals. Tiny fish hide in the lattice work of the fans, safe from predators. This is also a typical hideout for sea horses but I don’t see any. A lot of the stunning sights underwater are difficult to spot. Its often not until a dive master points out a dangerous stone fish or a group of prancing and courageous shrimps with their claws in attack position, that I can actually see them. Suddenly, I hear a light clanging sound. I swivel around and see my buddy behind me looking intently in the direction of the open sea, as he bangs his tank with his knife. I search as I scan my torch in indicated the direction. Then I see it! Two Blacktip reef sharks are doing a swim by. I am in awe. These two are relatively large and at th short distance, they are very impressive. They swim directly at us, looking straight into our eyes. I find sharks absolutely stunningly beautiful. They are the E-Type of the sea with their perfectly shaped bodywork and fins in all the right places. The gills would wouldn’t be misplaced on a Spitfire. Even that stupid inverted toothy grin has just the right curvature, as do the rows and rows of vicious teeth. Their eyes are deep. When a shark looks straight at you, as these two are doing right now, you can see animal intelligence of the highest order. Sharks are also one of the few large species that have survived unchanged since the dinosaurs, which is nature’s way of agreeing with me that their design is perfect. I don’t know if sharks have a bad reputation because of Hollywood blockbusters or whether we humans recognize the shark’s evolutionary superiority and feel threatened by them. Even so, sharks like these are less dangerous than pet dogs. Obviously, like the nicest pooch, you don’t want to put your arm in their jaws and then poke them in the eyes. 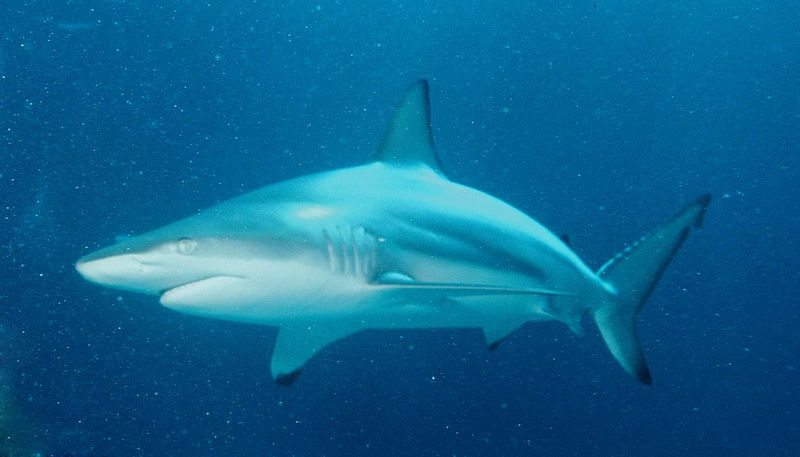 In reality, these Blacktips, as the large majority of other shark species are less of a worry than small cone shells that shoot poisonous darts that can kill you, or the nasty box jellyfish that make bathing in Queensland a worrisome adventure. The sharks glide slowly past us and seem to be observing us as much as we are observing them. My buddy and I are in awe. This is such a privilege! The other divers haven’t heard the tank signal and have moved on. They will soon stop when they realize that we have stayed behind. As much as we want to wait to see if the sharks will come back, we agree to join the others. As we reach them the dive master asks what’s up, by shaking an open hand. We make the shark sign: an open hand above our head, like a fin – and an excited look on our masked and magnified faces. No sooner have they understood what we have soon than the Blacktips make another appearance from the dark open sea. As we hang suspended in the nightly sea, arms crossed as if leaning on a fence we watch the sharks come straight at us before dipping down at the last moment. My daughter Angela, who is a little lower then the rest of us, watches the sharks – bigger than herself – pass her at just a few meters. There is no danger for us as these sharks are just patrolling the sea but I can see that this is a little too close for Angela and as soon as the sharks have passed, she quickly joins me and holds my arm. Her eyes are big, a mix of fear and excitement. I make the OK sign and she responds in kind. She smiles and I know that experience has won from fear. The shark encounter cuts our dive short as one of the divers is low on air, he probably used a bit more air in the excitement. We turn around and ascend slowly along the sea wall. We see more shrimps and a moral eel but I know that our minds are all still with the sharks. The amazing encounter lingers, as it will for a very long time. By the time we surface, the rain has stopped and the stars have come out. The boat spots us and comes our way. One by one we climb back on board and take our gear off. Big smiles as we excitedly share the experience. I have dived for many years and every dive is like a mini rebirth. The deep is an alien environment and there is always something to trigger awe. It may be a rare species that looks stunning from up close or it may be the seascape itself as we glide and fly underwater, into canyons or along walls. Sometimes it is the sheer difficulty of navigating with virtually zero visibility and a strong current or the challenges of going down to 40 meters or lower. Whenever I finish a dive, I have a deep sense of peace, like after meditation but more solid even. Then, I like to sit at the back of the boat and get soaked by the bow spray. I taste the seawater and as the boat bounces over the waves, I become one with the sea. There is no space left for thoughts and at that time, I am totally submerged in the experience. That is diving for me. Total submersion in the experience and deep encounters in the deep void. That, and looking into a shark’s eyes. I applaud you. 🙂 I’ve always wanted to dive but haven’t plucked up the courage.